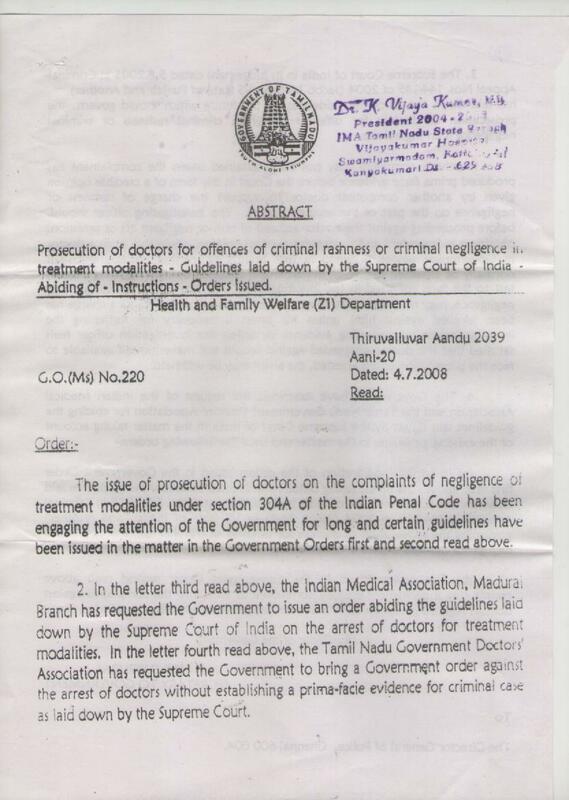 "A private complaint may not be entertained unless the complainant has produced prima facie evidence before the Court in the form of a credible opinion given by another competent doctor to support the charge of rashness or negligence on the part of the accused doctor. 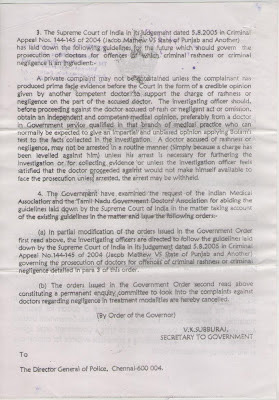 The investigating officer should, before proceeding against the doctor accused of rash or negligent act or omission, obtain an independent and competent medical opinion preferably from a doctor in government service qualified in that branch of medical practice who can normally be expected to give an impartial and unbiased opinion applying Bolam’s test to the facts collected in the investigation. A doctor accused of rashness or negligence, may not be arrested in a routine manner (simply because a charge has been levelled against him). Unless his arrest is necessary for furthering the investigation or for collecting evidence or unless the investigation officer feels satisfied that the doctor proceeded against would not make himself available to face the prosecution unless arrested, the arrest may be withheld". 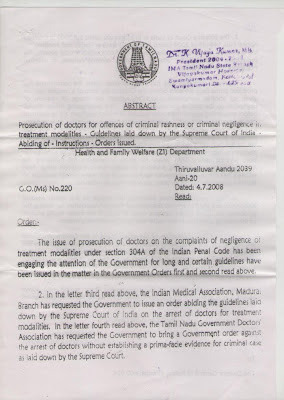 Tamil Nadu IMA has approached the Tamil Nadu Government and got a GO NO.220 of 2008 Dated 4.7.2008 to implement the same Judgment in our State. It is high time IMA Head Quarters should get such an order from Central Government and also the respective state branches should approach and get a similar GO no.220 of 2008 like Tamil Nadu. The resident doctors' association and students at the All-India Institute of Medical Sciences (AIIMS) called off their relay hunger strike on Thursday after the hospital authorities assured them that their demands would be addressed immediately. The group has been agitating since Anil Meena, a 22-year-old medical undergraduate student from Baran district in Rajasthan, was found hanging from a ceiling fan in his hostel room last week. medical negligence without prima facie evidence. 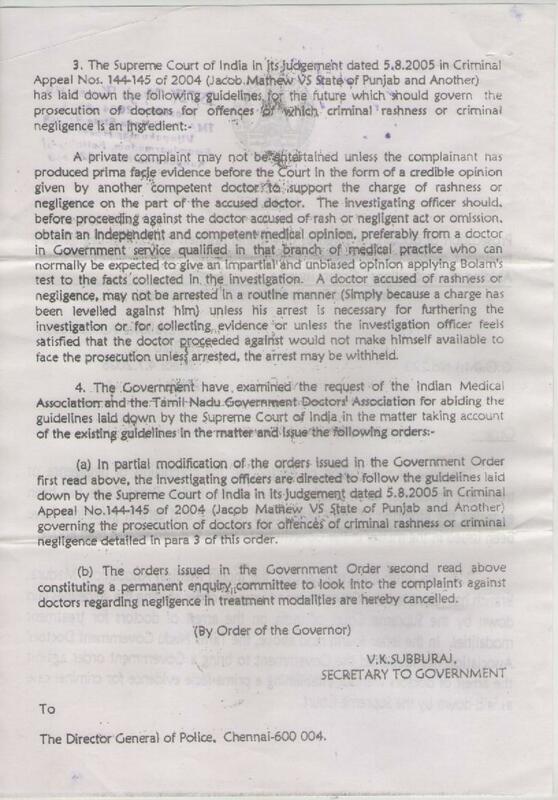 doctors for alleged medical negligence without seeking an opinion from experts. Protection Act,” the court said. before issuing notice to the allegedly negligent doctor. policemen will themselves have to face legal action,” the apex court said . Head of the Department of Nuclear Medicine of Kidwai Hospital, Dr Parameshwar, went missing under mysterious circumstances on Saturday night. Janet, the wife of the 59-year-old doctor, a resident of Rajajinagar, lodged a complaint with the police on Sunday that her husband went out around 6 pm, on Saturday, saying he wanted to meet a dentist, but failed to return. Janet called him up at 9.30 pm and he told her he would be back home late in the night. She dialled his mobile number around 11.30 pm, but it was switched off. The police have launched a search operation to trace him. More than 700 doctors of Civil Hospital went on a strike late on Friday night after a resident doctor was allegedly beaten up by relatives of a patient that died during treatment at the hospital. The doctors' association claimed support from other government hospitals in the state over issue of inadequate security. Senior state health officials rushed to the hospital to pacify the doctors on strike but the deadlock was not resolved as on Saturday night. According to Shahibaug police officials, they recorded cross-complaints on Friday. 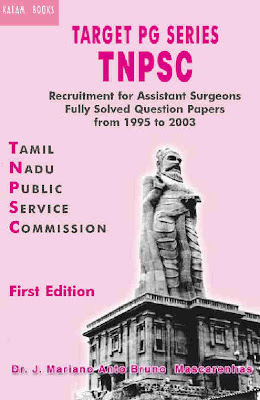 "As per a complaint by Dr Nitin Chaudhary, a first-year surgery student, he was on duty at the C4 ward of the hospital. The doctor was summoned by the relatives to have a look at Shehnaz Bano Mansuri, 32, a resident of Rakhial, who was admitted in the ward. Mansuri was admitted for a fortnight due to swelling in the small intestine. She was not keeping well for two days and had become critical. When Chaudhary attended to her for the third time, she had died", said a Shahibaug police official. When Chaudhary declared her dead, he was assaulted by Mansuri's relatives led by Ismailbhai, her husband who accused him of negligence. Chaudhary later filed a complaint for assault against a group of five with police. As Shukal, inspector of Shahibaug police station, told TOI, Mansuri's family members have filed a cross-complaint against Chaudhary and Civil Hospital staff for negligence that led to her death. TOI that a physical or verbal abuse of a doctor at the hospital has become a routine affair. "Every fortnight, at least one doctor is abused in the hospital by patients' relatives. We cannot work in such an environment and demand assured security at the workplace. While other states have legislations making such an assault a non bailable offence with three years' imprisonment and monetary fine, why can't the state take step towards that direction? More than 700 doctors have joined us and we have got support from hospitals in Bhavnagar, Surat, Jamnagar and VS Hospital," said Patel. Another member of the association said that it is a now or never situation. "We have been promised better security for last three years but nothing has happened. We want the government to understand our situation and pass the resolution in the ongoing session of legislative assembly," said the doctor.